This drawstring knitting project bag is fully reversible so you get 2 bags in one. The bag is made from Mushroom Fabric and is 100% cotton. The bag has a pale blue cotton lining. The bag has a flat square base to allow it to stand up by itself while you’re knitting, making it perfect for use when you’re out and about. This bag will fit any sized project in. As well as your yarn the bag will fit all of your essentials like your double pointed needles, a tape measure, scissors and a small needle case, so you can have your complete project all in one bag. 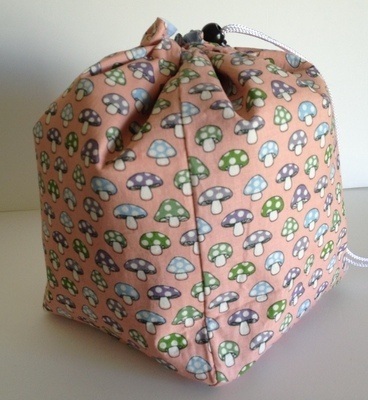 The bag features a pocket made from the same mushroom fabric if you want to keep your notions separate from your yarn. The drawstring is made from cord and finished off with a lockable plastic stopper for extra security. The drawstring leaves space for your yarn to feed through, so you can knit with the bag closed.